Virtual and Augmented Reality based tech solutions are becoming more and more popular in Manufacturing, Health, Retail, Entertainment and many more sectors. It has already proven to have the power to create unforgettable customer experiences, as a core of innovative marketing or advertising campaigns. The impact VR and AR technologies had in Health and Manufacturing sectors are impressive and show possibilities of these technologies in the future. The VR / AR / MR / 360 Observatory brings together experts, producers, professionals, brands, students, trainers and entrepreneurs from all sectors involved in the Virtual Reality industry , Augmented Reality, Mixed Reality, 360º, videogames, eSports, the offer of glasses, cameras and video consoles, training, platforms, content and its application in sectors such as tourism, social innovation and medicine , among others. We are already preparing the second edition. It will take place on July 18 and 19, 2018 , at the Digital Content Center of Malaga. The Virtual, Augmented and Mixed Reality Course in Madrid is designed for people without prior knowledge or who are starting in virtual reality as a medium, and want to specialize in the development of their own projects. We will begin with the basic concepts of virtual reality, hardware and history, up to the different applications in different industries and the involvement of artificial intelligence. The course is taught in a total of 100 hours in which, through 6 highly practical modules, the components of the RV ecosystem, the mobile devices and the autonomous all-in-one are reviewed. 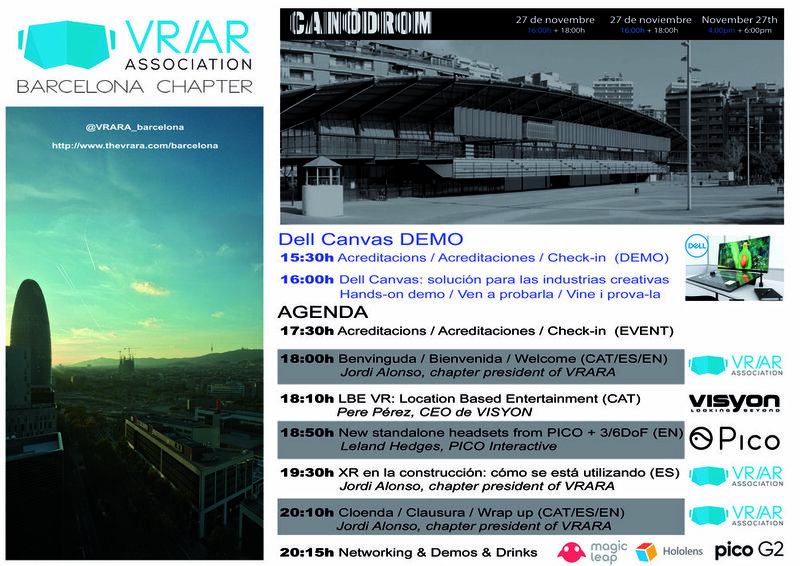 Join us at the Spring Event of the Barcelona Chapter of The VR/AR Association during the evening of June 1st at Canòdrom Creative Research Park facilities in Barcelona. 20:45h Networking and you also will be able to try the new headsets PICO Neo 6DoF and Oculus Go, next to demos of the VISYON and PSIOUS solutions. Registration of guests starts at 17:30h. You need a ticket to attend, because seats are limited. Request yours to the BCN Chapter President (jordi at thevrara dot com). Visit www.canodrom.com for directions to the venue. The Fourth Edition of the European BIM Summit (EBS18) will take place on 7, 8 and 9 March 2018. The venue has been confirmed as the AXA Auditorium at L’Illa Diagonal business and shopping centre in Barcelona. At the last celebration of the Summit, in 2017, there were 64 speakers and all available places were taken, with a total of 550 visitors. For this reason, a larger, more central venue was required for EBS18, and a 600-seat auditorium in the centre of Barcelona’s city heights was found to host the event. The programme for each of the three days of the event is clearly differentiated: March 7 is a day open to the general public, when business and technical opportunities will be generated around the theme of the Digitisation of Construction. The programme will also include an event aimed at future stakeholders: vocational training and university students, who will account for the greater part of those working in the sector. The second day will be devoted to applications that are implemented today, throughout Europe and the world. Under the title BIM Present, the latest developments will be presented, with discussion of the impact of this new work procedure based on management of information and data generated throughout the life cycle of a construction, from project stage to maintenance and later rehabilitation. This approach has become indispensable for creating a design, construction and operational process that is controlled and aimed at improving quality, efficiency and efficacy, whether in a building or a piece of infrastructure. On the third and last day, under the motto BIM Future, the programme will feature talks given by BIM gurus, keynote speakers who will discuss new developments in BIM, and presentations of international start-ups that have become economic phenomena thanks to the products and services that they provide to the construction industry and that would not exist without BIM. Finally, the programme will close with a presentation of developments in robotics, already being applied through use of the digital data generated by projects. MWC is the undisputed industry champion when it comes to mobile innovation. More Than 100,000 people will attend. More Than 2,200 organizations will exhibit. Dine at Barcelona's best in an intimate setting dinner while you get news & insights from high-profile VR AR industry experts and leaders. Join your peers for a round table discussion on VR AR market and trends, and issues affecting your company, project, or role. Join us for a fine dinning experience and short presentations from industry thought-leaders. Come meet VRARA members Nestle, Gravient, Visyon, and others. Last year we had a successful event with 25 executives (see recap here); we are looking forward to seeing all of you again plus new faces! RAN World 2017 bridges the gap between business strategy and technical expertise, bringing MNO CTOs and engineers together for a deep-dive look into challenges, sharing and growing knowledge.